Designed to complement our Contintal Slotted Posts. Available in 2 sizes, intermediate/end cap 125mm x 150mm and a corner cap 155mm x 155mm. 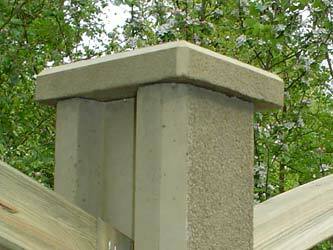 Made from reinforced concrete these items are designed to offer greater durability than timber. Our Post Caps are both decorative and practical as they protect the end-grain of the fence post.